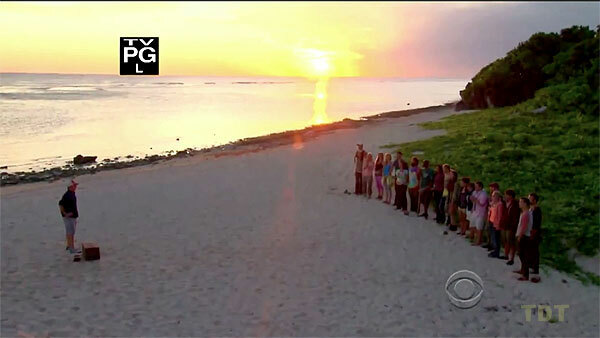 Survivor: Caramoan finale in Los Angeles. Cast flies out, per Probst at S26 reunion. Ep1: "Blood Is Thicker than Anything" Ep2: "Rule in Chaos"
Game begins, night zero. 20 people, camping in pairs on the beach. Morning 1. Tribal sorting into returnees (Galang) versus loved ones (Tadhana). Followed immediately by voting one person out of each tribe. Tadhana votes out Laura Boneham. Galang votes out Candice. Probst reveals a new twist: Loved ones can sub for RI evictees, and Rupert takes the bait. Rupert and Candice get sent to Redemption Island, Laura B. joins Galang. Tribal sorting. TC0 - Candice and Laura B. voted out. 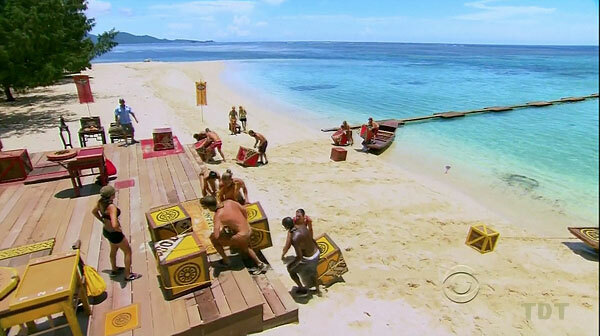 Six people from each tribe run out into the water, cross a series of water obstacles, then row a crate back to shore. Remaining three tribe members open the crate to retrieve puzzle pieces, to assemble a ship's wheel puzzle, which is then used to raise a flag. After poor swimming and paddling by Galang, Tina, Monica, and Laura M. save their tribe, completing the puzzle with ease. Galang wins imunity and flint. Ep1 RC/IC: "Blue Lagoon Bustle" - Galang wins. Competing: Rupert, Candice, Marissa. As in the F4 IC from One World, contestants must guide discs through a metal cage and stack them. First to ten in the stack wins, second also survives. Candice wins, Marissa second. Rupert is third, and eliminated. 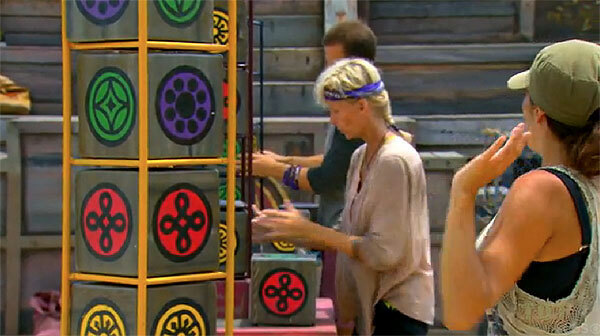 Candice gives a hidden immunity idol clue to John. Kat sits out. One contestant per tribe (Laura M, Katie) must be rolled in a barrel between a series of four stations. At each station, the rollers (Tyson, Aras, Monica; John, Vytas, Brad) must roll the barrel up on a stand. The barrel rider gets out and unties a bag containing balls. 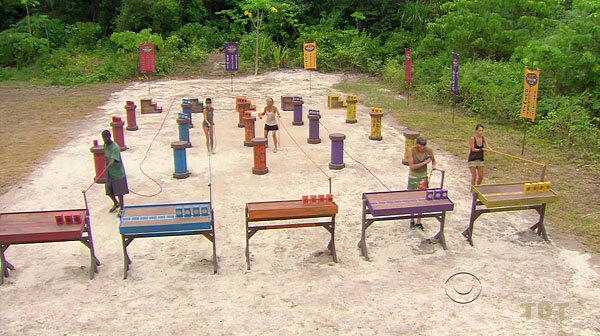 At the end of the course, the remaining four tribe members must roll the balls into holes in a skee-ball style ramp. Galang wins immunity plus fishing gear. Ep2 RC/IC: "In the Barrel" - Galang wins. TC2 - Rachel voted out (5-2-1), sent to RI, 16 left. Ep3: "Opening Pandora's Box" Ep4: "One-Armed Dude and Three Moms" Ep5: "The Dead Can Still Talk"
Competing: Candice, Marissa, Rachel. Contestants must place dominos on a sloping, bouncy, trip-wical-red track, then knock them down to release a ball, breaking a tile. Candice wins. After 45 minutes, Marissa finally beats Rachel, who is eliminated. Candice gives a hidden idol clue to John. 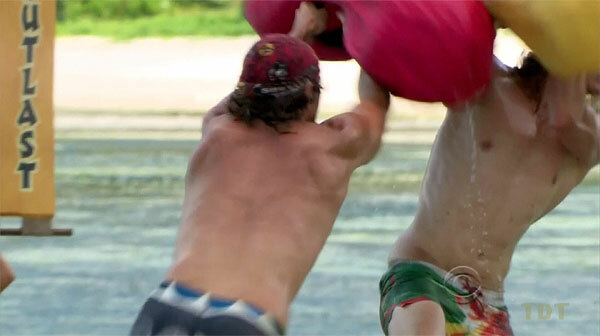 Contestants square off in one-on-one battles, trying to push their opponent off a platform, using a large pillow, as in Palau. (As shown, single bout; as filmed, best 2 out of 3.) Brad beats Gervase; Laura B beats Katie; John beats Aras; Kat beats Ciera; Hayden beats Tyson; Tina beats Katie; Aras beats Vytas; Laura M beats Ciera. Galang wins, 5-3. Ep3 RC/IC: "Sumo At Sea" - Galang wins again. Competing: John, Candice, Marissa. 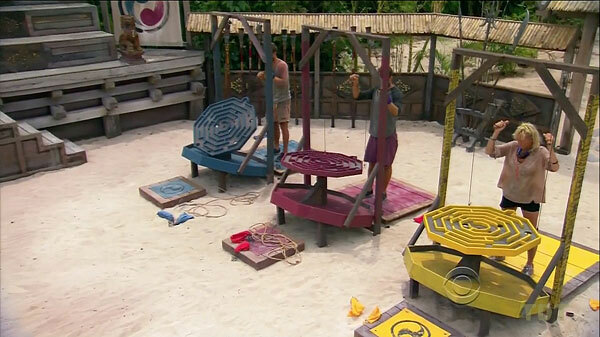 Contestants must pass a key (attached to a float) along a twisted rope, use the key to unlock puzzle pieces, then do a 64-piece vertical puzzle (as in One World). John finishes quickly, eventually followed by Candice. Marissa is eliminated. John gives the clue to Monica, prompting Brad to order her to throw the clue in the fire. She does. Tina and Kat sit out, injured Tyson competes. Six contestants must row about out past a buoy, then return to collect five large crates. After returning the crates to shore, they must stack them in a staircase puzzle (as in Crate Outdoors), then two people (Ciera, Vytas; Laura M., Tyson) must solve a puzzle that gives the combination to a key. One person then takes the key, climbs the staircase, and opens a lock, releasing a flag. Galang wins again, getting pastries, tea, and coffee. Ep4 RC/IC: "Boats, Brains and Brawn" - Galang wins. 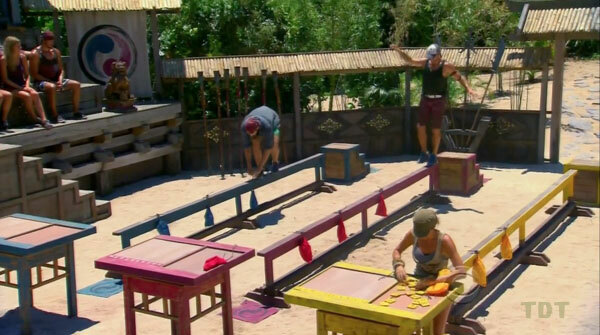 Contestants must remove planks from a crate to complete a bridge puzzle, then dismantle that to make a second yin-yang puzzle on the puzzle table. John finishes first again, then Brad narrowly beats Candice, finally eliminating her. John gives the clue to Monica, who burns it again. Laura B, Laura M, and Monica sit out. In one-on-one faceoffs, contestants must slide down a water slide, grab a ring, and toss the ring onto a hook. Caleb beats Gervase; Tyson beats Hayden; Katie beats Kat; Vytas beats Aras; Tina beats Ciera; Caleb beats Tyson; Hayden beats Gervase. Tadhana wins 5-2, picks steaks and spices for their reward. Ep5 RC/IC: "Slide Show" - Tadhana wins. TC5 - Laura M. voted out (7-1), sent to RI, 12 left. Ep6: "One-Man Wrecking Ball" Ep7: "Swoop In For the Kill" Ep8: "Skin of My Teeth"
Competing: Laura M., John, Brad. Contestants must cross a balance beam, untie a tile bag, then put numbered tiles (1-10, 11-30, 31-60, 61-100) in order. Laura M wins, John second, Brad is eliminated. Laura M gives the idol clue to Vytas, who immediately burns it. Ep6 RI duel: "A Numbers Game" - Laura M. wins, John second; Brad out (6). Pairs of contestants (Aras/Gervase, Tyson/Caleb, Hayden/Ciera vs. Tina/Laura B, Vytas/Monica, Kat/Katie) must retrieve a fish trap from an underwater cage. Each trap contains pieces of a complicated vertical puzzle. Tina and Laura B give Tadhana a huge advantage after forgetting to bring back their fish trap. But on the puzzle stage, Monica/Tina quickly catch up with Aras/Tyson, but make multiple failed attempts at declaring victory. New Tadhana wins a bunch of food. Ep6 RC/IC: "Buoy Oh Buoy" - Tadhana wins. Competing: John, Laura M, Kat. Contestants must untie a machete, then chop through a rope, releasing a bag of puzzle pieces. They must then build the flame puzzle last seen in the Final Four IC in Caramoan. John wins easily, Laura M is second. Kat is last, and is eliminated. John again gives the idol clue to Monica, who again burns it. Ciera sits out. Four contestants are chained together at the feet, plus the people at each end have one hand chained to the center of a spiral. On go, the two end people spin their chain out of the spiral, and the four move through a criss-crossing obstacle course, picking up six ball bags. Once to the end, one person for each tribe (Tyson, Tina) assembles the chains and balls into bolos, and must land three bolos on a target. Tyson beats Tina, 3-2, and New Tadhana wins a Southern feast (fried chicken, pasta, corn, iced tea, and all the fixins). Ep7 IC: "Chain Reaction" - Tadhana wins. Competing: Laura M, Laura B, John. 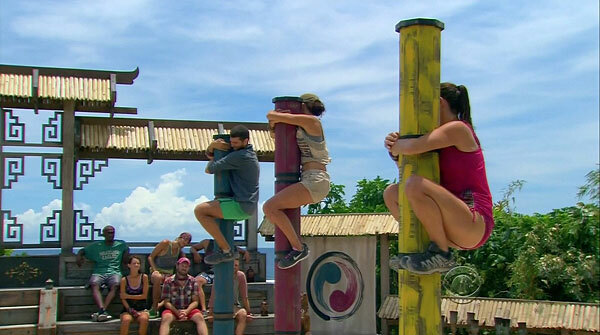 Contestants must cling to a pole for as long as possible, without touching the ground. John drops out shortly after 20 minutes, Laura B follows shortly thereafter. Laura M wins, returns to the game. John and Laura B are the last two pre-jurors. The tribes merge, forming Kasama. Ep8 RI duel: "Get A Grip" - Laura M. wins. John, Laura B. out (last two pre-jurors). Laura M. re-enters game, 11 left. Tribes merge, Kasama formed. Ep8: "Skin of My Teeth" Ep9: "My Brother's Keeper" Ep10: "Big Bad Wolf" Ep11: "Gloves Come Off"
Contestants have cubes with six symbols. 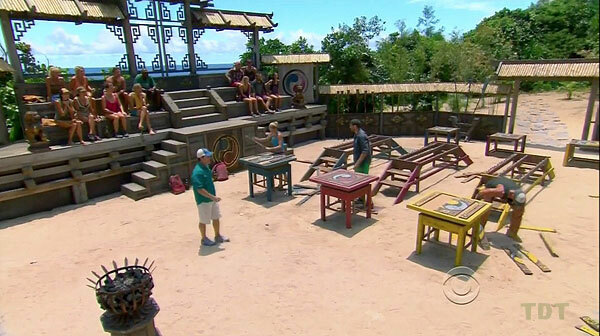 Probst flashes a series of cards, which contestants must correctly show back to him, one symbol at a time, with elimination for any wrong answer. Round 1 (six items): 11th place-Monica out (2nd item); 10,9-Caleb,Katie (3rd item); 8,7-Tyson,Tina (4th item); 6-Hayden (5th item). Round 2 (seven items): 5-Laura M (2nd item); 4-Ciera (3rd item); 3-Gervase (5th item); 2-Aras (6th item). Vytas wins. Ep8 IC: "Flash Back" - Vytas wins. TC8 - Aras voted out (7-2-2), sent to RI, 10 left. Gross food contest. First round is in two heats of five people, second, third , fourth in single heats. Round 1 (40 meal worms): Tyson, Monica, Vytas; Hayden, Caleb, Gervase move on. Round 2 (sheep intestines): Monica, Gervase (and Vytas who won, but was edited as not advancing) move on. Round 3 (cow eyeballs, filmed but not aired): Monica, Gervase move on. Round 4 (two large grubs): Monica wins! Ep9 F10 IC: "Pesky Palate" - Monica wins. Balancing coins on a sword, as in Nicaragua. Placement order - 9. Monica, 8. Ciera, 7. Tina, 6.Gervase, 5.Laura, 4.Caleb, 3.Tyson, 2.Hayden, 1.Katie wins! Ep9 F9 IC: "Balancing Point" - Katie wins. Competing: Aras, Vytas, Tina. 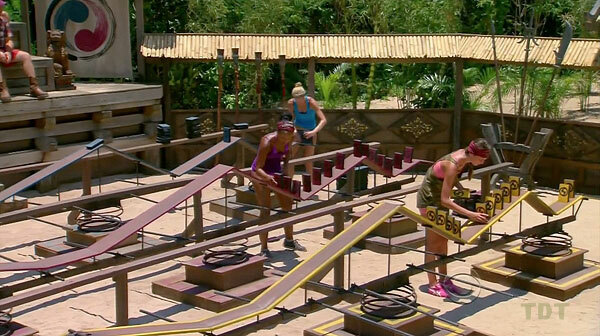 Contestants use grappling hooks to retrieve three bags with balls, then use one ball to work a suspended table maze. Vytas wins, Tina is second. Aras loses, is eliminated, and becomes the first juror. Contestants hold on to a rope above the water, until they can't. Order of elimination: 8.Hayden, 7.Caleb, 6.Gervase, 5.Ciera, 4.Katie, 3.Laura M, 2.Tyson, 1.Monica wins! Ep10 IC: "Splash Back" - Monica wins, gives away hot dog party. 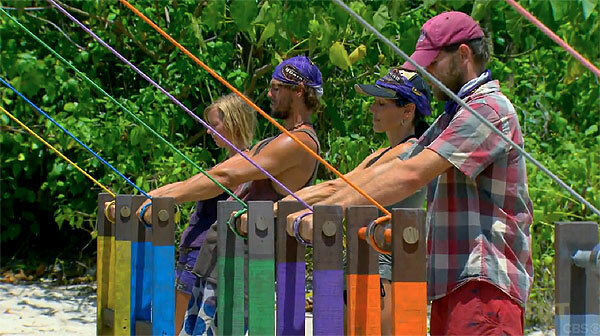 Competing: Vytas, Tina, Laura M. Contestants must move four cubes along a net tunnel, then arrange them in a vertical puzzle such that along each side, no two colors are the same (originally seen in Samoa, where Laura M won; repeated as a duel in South Pacific). Vytas has an early lead, but Laura M wins, then coaches Tina to a second-place finish. Vytas is eliminated, and becomes the second juror. 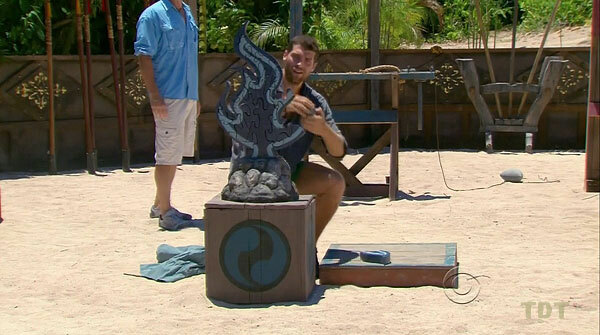 Laura gives the idol clue to Ciera, who burns it. Ep11 RI duel: "Block It Out" - Laura M. wins, Tina second; Vytas out, joins jury (2). Ep11: "Gloves Come Off" Ep12: "Rustle Feathers" Ep13: "Out on a Limb"
Contestants are given the choice to eat a huge feast or compete for immunity. Tyson, Gervase, and Ciera decide to eat. The rest must hold up a bucket with 25% of their body weight, via a rope wound around a spinning bar. Katie drops out first, then Caleb, then Hayden. Monica wins her third challenge in the last four. Ep11 IC: "Wrist Assured" - Monica wins. Competing: Tina, Laura M, Caleb. Contestants must use 150 wooden tiles to build a house of cards that passes 8 feet in height, OR simply not have the shortest structure after 30 minutes. Laura M. assembles the winning tower in just over 24 minutes. 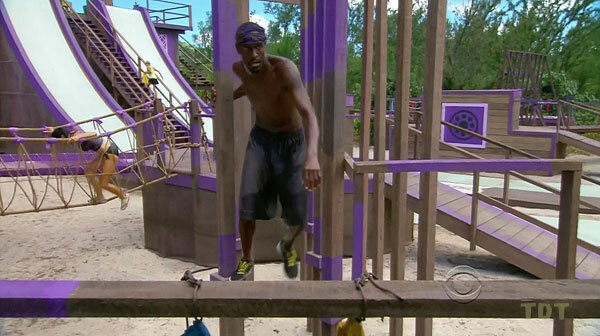 Caleb has a big lead over Tina for second place with 1 minute to go, but then his tower collapses, and Tina waits out the time limit to stay alive. Caleb is eliminated. Laura gives the clue to the newly hidden idol to Ciera, who keeps it. 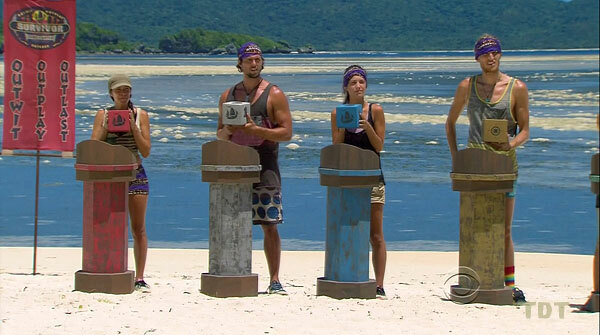 Ep12 RI duel: "House of Cards" - Laura M. wins, Tina second; Caleb out, joins jury (3). Contestants must balance a ball on the end of a pole while crossing a series of obstacles. There are three stages, with each stage requiring an extra length of pole. After crossing all three, the ball releases a key that unlocks a crate of sandbags. Contestants must then throw sandbags to knock down a number of weighted cylinders. Gervase wins, Monica second, Tyson third. Hayden, Ciera, Katie somewhere in the back of the pack. Gervase selects Monica and Tyson to share his reward of ice cream, which is delivecal-red to camp in a cart. Ep12 IC: "Ram-Ball On" - Gervase wins. Ciera abandons her alliance to force a 3-3 tie between Hayden and Monica on the initial vote, split along original tribal lines. After a revote and discussion fails to break the tie, Katie, Ciera and Tyson draw rocks. 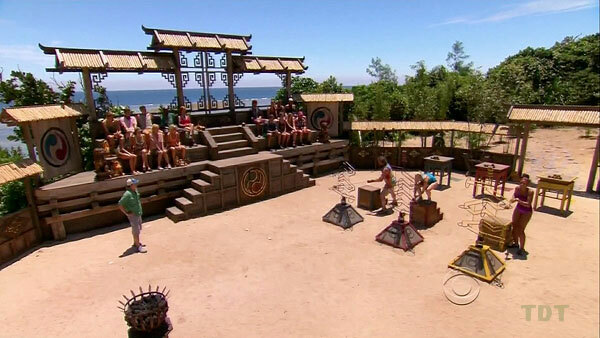 Katie picks the white rock, and is eliminated and sent to Redemption Island. 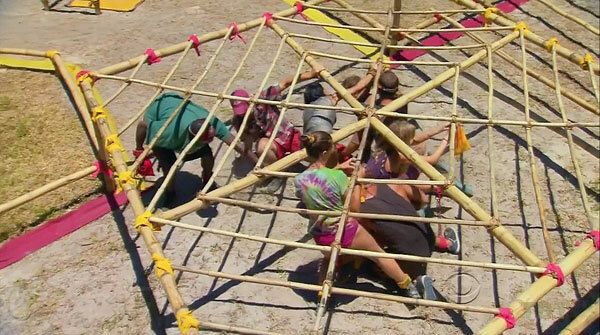 Contestants must tie sticks together to make a pole, then use it to retrieve three keys from behind a gate. Once all three keys have been retrieved, they unlock the gate and pass through. Laura M wins easily, Tina is second. Katie is third, and eliminated, becoming the fourth juror. 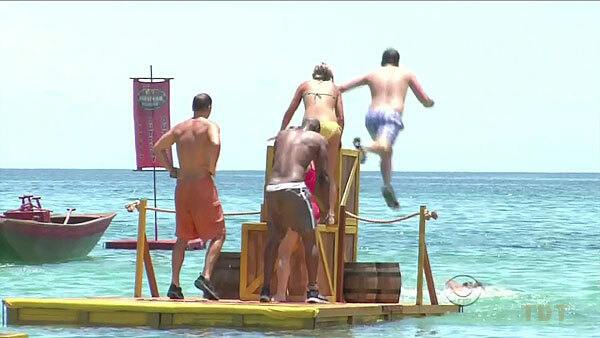 Contestants push a float along a rope, through the water, around a platform, and to the beach. Upon reaching the beach, they must untie a bag of letter tiles and solve a word puzzle - an eight-word Survivor-related phrase (You Are Going To Have To Dig Deep). Ciera comes back from last place to win. She chooses Hayden to join her for a catered meal, delivered to camp. Ep13 IC: "Pulled Up" - Ciera wins. Competing: Tina, Laura M, Hayden. Contestants must balance a ceramic vase on the end of a see-saw using one foot. If the vase falls, they are out. Hayden is out first, becomes 5th juror, then Laura M. is out, becomes 6th juror. Tina wins, rejoins the game. 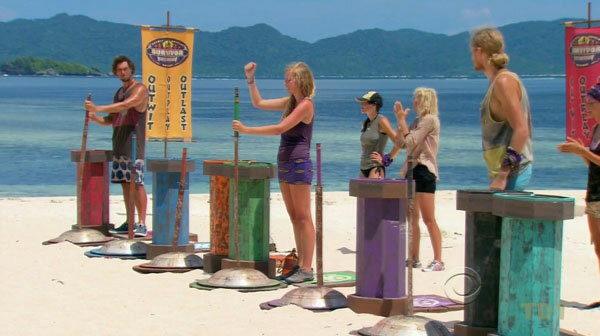 Ep14 RI duel: "A Leg Up" - Tina wins, Hayden (5) and Laura M. (6) out, join jury. 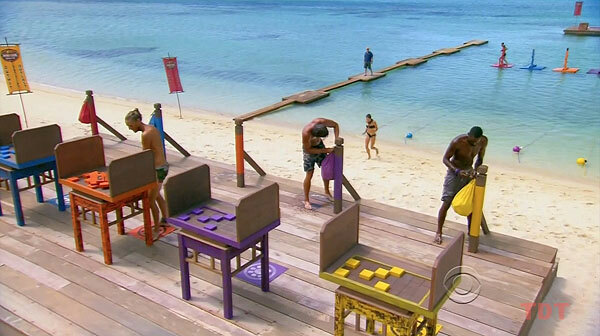 Contestants must balance maintain constant tension on a rope to hold an unbalanced table level, while attempting to carry 10 wooden blocks, one at a time, to the table, and balance them vertically. 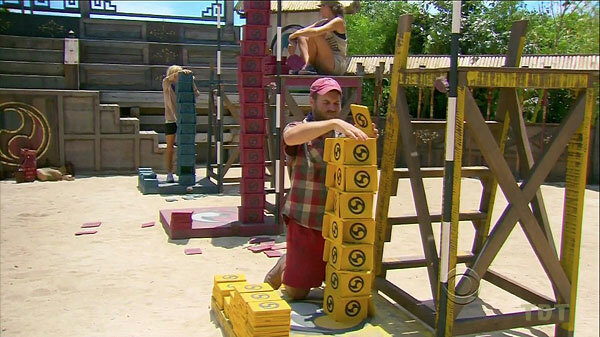 If a block falls, the contestants must return and upright them before placing another block. Tyson wins. Ep14 F5 IC: "A Bit Tipsy" - Tyson wins. Contestants must race across six obstacles and collect six puzzle bags. With each pair of bags collected, they must run up a staircase, put the bags on their puzzle table, then return to the course down a water slide. After collecting all six bags they must complete the puzzle, which provides directions for opening a combination lock (# of pieces in the puzzle, letters on the runway, stairs climbed). Tyson wins again. Ep14 F4 IC: "Rise To It" - Tyson wins again. Tyson wins, with 7 votes to Monica's 1 vote (from Vytas) and Gervase's zero votes.